The Government has earlier this month announced its strategic plan for job creation aimed at meeting the long-term, sustained goals outlined in ‘Enterprise 2025’. The 2017 plan builds on the progress achieved by past Action Plan for Jobs (APJs), though it also articulates its response to the uncertainties deriving from ‘Brexit’. Since the first APJ was launched in 2012, almost 190,000 jobs have been created in Ireland. Strategies such as developing globally competitive business clusters; enhancing cooperation and coordination between government departments; stimulating regional economic development; promoting research, development and innovation (RDI); and diversification in export markets have allowed Irish companies to both sustain themselves and scale in recent years. Geoscience Ireland (GI), a state-supported business development cluster of 29 Irish companies targeting natural resources and infrastructure development projects in overseas markets, is encouraged to learn that the 2017 plan continues to support cluster development and that the APJ has a renewed focus on diversifying Irish trade toward new and emerging markets. 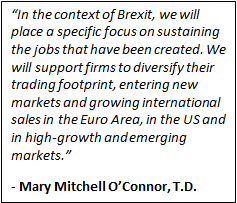 Against the backdrop of ‘Brexit’, Mary Mitchell O’Connor TD, Minister for Jobs, Enterprise and Innovation, stated that Ireland is committed to growing “non-UK trade b y over 50% by 2020”. The Minister also noted that the government will place specific focus on “sustaining and embedding our exports in the UK”. GI Member Companies have an impeccable track record and diverse project experiences in the UK while half of its Members have offices or depots situated there. In a survey conducted last summer, 86% of GI Member Companies expressed concern regarding the possible effects of ‘Brexit’ however the Members remained resilient and pragmatic with regard to identifying and bidding for opportunities in the civil engineering and construction industry. The Royal Institution of Chartered Surveyors (RICS) Construction Market Survey in Q3 2016 reported that expectations are improving in the UK as workloads continue to moderately rise and future growth expectations are also improving, though financial constraints and skills shortages are still very evident. Geoscience Ireland offers niche technical skills to the sector and its Members are encouraged by the progress of UK ‘Mega Projects’ such as High-Speed Rail 2 and further strategic rail developments while the imminent development of Heathrow Airport and Hinkley Point power station is also good news for the market. The diversification piece outlines new and emerging markets as export targets for Irish companies and the composition of the Irish offering will be paramount in gaining traction in such regions. GI Member Companies have experience in high growth markets such as the Gulf region and also emerging and developing markets such as sub-Saharan Africa and Accession States in Eastern Europe. The proposed tailoring of State supports to include “low-cost credit and increased credit supply from the Strategic Banking Corporation of Ireland (SBCI)” will also be well-received by industry allowing them to finance and grow in an efficient and effective manner. Such support, coupled with the networks provided through Enterprise Ireland and the Department of Foreign Affairs and Trade, will prove to be a key resource in accessing and sustaining market access overseas. GI’s approach to job creation and business development aligns well with the Action Plan and also draws on the its goal of supporting and developing indigenous SMEs in a manner that will sustain export-targets while creating jobs and economic growth within the Irish economy. Geoscience Ireland announced in January (see more) its Member Companies created 179 net new jobs, with more than 50% of domestic jobs being created outside Dublin, in 2016. This brings to a total of 477 net new jobs created since its inception in 2012, with more than two-thirds of revenue derived from export markets. Promoting innovation remains a key component of the Action Plan. In Ireland, and internationally, RDI is a core spoke in cluster development and it facilitates SMEs evolving in a manner where they can access markets with new technologies and innovative practices. Geoscience Ireland, and the Geological Survey has provided support for the initiative since its inception, in areas such as technical advisory, data, research collaboration and industry partnering. Linking Industry and Innovation is a targeted way to create further jobs in the geoscience sector. Geoscience Ireland (GI) is a network of 29 companies, delivering integrated expertise in water, minerals, environmental and infrastructure development to clients in over 50 countries. GI is supported by the Geological Survey of Ireland (a division of the Dept. Communications, Climate Action and Environment) and Enterprise Ireland. The GI network provides design, consultancy and contracting services to multilateral agencies, governments and the private sector.